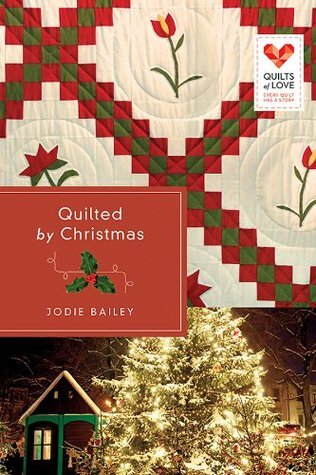 Quilted By Christmas by Jodie Bailey | Quilts of Love #22 | Stop #1 of my Salute to Christmas Reads! Quilted By Christmas is one of those books I just LOVE to read at this time of year. It always makes – those of us who have struggled with a difficult past – feel better to know that we are NOT alone. There are very few people in this world who had a “perfect” childhood and even less who don’t at leasy know someone who had a rough time as some point in their life – so I believe almost everyone who reads this book will be able to identify with Taryn in one way or another. I have also had some experience with the main conflict in this story – when your past comes back and tries to drag you back down. Jodie handles this extremely well, giving you a look at the emotions and turmoil that go along with the experience. And if Jodie is not drawing from personal experience in this very same matter, I certainly can’t tell! One way or another, she is a FANTASTIC author and she has written a stellar book – not one I would have thought of as a Christmas story – but it really fits! And I believe it will give readers an unexpected lift this Holiday season! < Previous I LOVE Christmas! | SPECIAL HOLIDAY SPOTLIGHT! | Salute to Christmas Reads! Next > Author Spotlight: Martha Rogers | And WATCH for my review of Christmas at Holly Hill this month!